…or any bold dark colour really – the key is contrast and keeping the black under control. Where black gets to be exciting is being able to source items that normally are not black. Like bath tubs or plumbing fixtures. Contrast is key. As is using the black sparingly and keeping it the accent in the space. 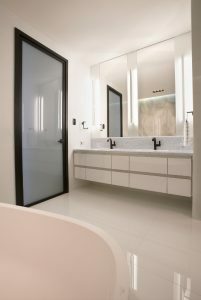 For this bathroom interior design we used a crisp white tile on the floors and walls combined with a custom shower base and shower control column made out of matte white Krion. 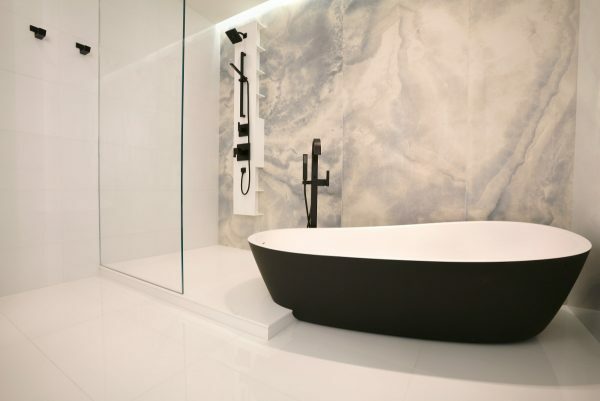 The feature wall is 6mm porcelain slab 1 metre wide x 3 metres high which allowed us to highlight the black tub perfectly. This space works because of how simple everything is presented. No door on the shower, no hardware, no visible lighting. Even the floor drain is concealed. So anything that was going to be visible had to be black. If it wasn’t black, it wasn’t allowed in the bathroom renovation. The devil is in the details though and as soon as we move away from the typical polished chrome or brushed nickel bathroom finishes, we had to be really careful we could get everything we needed not just in the same colour but the same sheen and texture, too. One company’s black isn’t the same as another. We sourced aluminum door frames that we had anodized black to match the black faucets, shower fixtures, robe hooks, towel bars and even a black lever on the toilet. Personally, I hope this dramatic style of design continues. I think it adds an element of strength to a space that otherwise can sometimes feel a little subtle.